I've had many inquiries about how Achilles is doing in his new home. For those who don't know, Achilles was adopted as a security dog as well as a family pet. He will work during the day with his officer and go home at night for cuddles and ball play with the significant other. I was touched by all the kind words. John is working today so it was my turn to take Achilles for a walk. I decided to take him around the Cochrane Ranche House. Lovely huge park area with lots of pathways shooting off in every direction. When I arrived at the car park I noticed a school event taking place in the distance. Not deterred, we started off on our walk. We encountered tons of screaming, shouting, throwing balls everywhere kids and Achilles did not bat an eyelid. We came across a few dogs and their owners too, again this beautiful big bold boy did not bat an eyelid. He walked to heel most of the time without even being asked. About 45 minutes later we arrived back at my vehicle and off we went to Safeway. I nipped in to buy milk and was out again in a jiffy, Achilles was quite content. At this point I decided to test him with a walk through the town of Cochrane, the busiest road of them all. We walked along one side encountering lots of people, lots of traffic and a train!! We crossed over the road and navigated our way through the crowds outside MacKay's Ice Cream. Achilles walked to heel at all times taking everything in his stride - he was being admired by all. Seriously Mary Ann, nothing fazed him. All I did was to tell him he was a very good boy every now and again. We walked back to my vehicle which was parked outside the Rexall store and after giving Achilles tons of praise and a treat or two, I drove us back home. What a fantastic couple of hours we spent together. It really was amazing, especially when you think that we only picked him up from you on Saturday morning. Achilles must trust us implicitly to behave the way he does. The excellent training you have given this gorgeous German Shepherd throughout his six years is second to none, all credit goes to you Mary Ann, you should be very very proud of yourself. John and I realise how difficult it was for you to give up Achilles on Saturday, but we are so pleased you did. Thank you from the bottom of our hearts for trusting us with this amazing dog (trust works both ways, not just from a dogs point of view but from a humans too). Rest assured Achilles will have the best home we can give him. He will be loved and cherished unconditionally and I know this will be reciprocated. John and I have had five German Shepherds throughout our time together. We lost our last two suddenly, old age took them (Tsar and Dylan) only a few months ago and it broke us. Achilles came along and we think he was heaven sent. Our hearts are now starting to heal and we can move forward together....the three of us. This is the beginning of a bright new future for Achilles,John and myself. 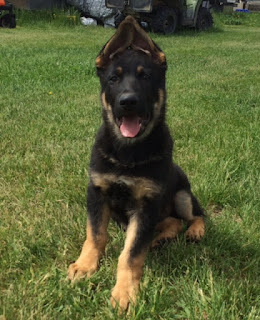 Achilles will be going to work with John very soon so he will have a lot of exciting new things to look forward too. Watch this space for more news and photo's of the handsome, big, very bold Achilles....we absolutely adore him and love him to bits. Thank you, thank you, thank you to all the precious Guardian Angels for being there for us, to protect us and for us to enjoy life to the fullest moving forward together, and of course, thank you a million times over to Mary Ann who is most definitely a Guardian Angel herself. Love you all. Just to let you know we would not buy a German Shepherd from anyone else but you Mary Ann. No one out there can beat your knowledge and expertise, so please keep up the good work. Love and best wishes always, from a very grateful Sonia and John. The one on the left is Fia and she's five years old. The one on the right is Isis and she is 13 1/2 years old! 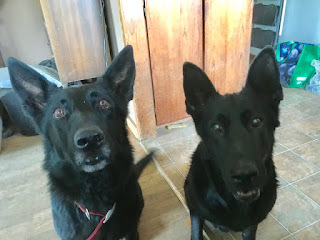 Which one of these beautiful black German Shepherd's is 13.5 years old and which one is five years old? I put this out on my blog from time to time so anyone new watching will be sure to see it. There is an exceptional website for you to learn just about everything you need to know about raising your dog/puppy. It's called http://www.leerburg.com. 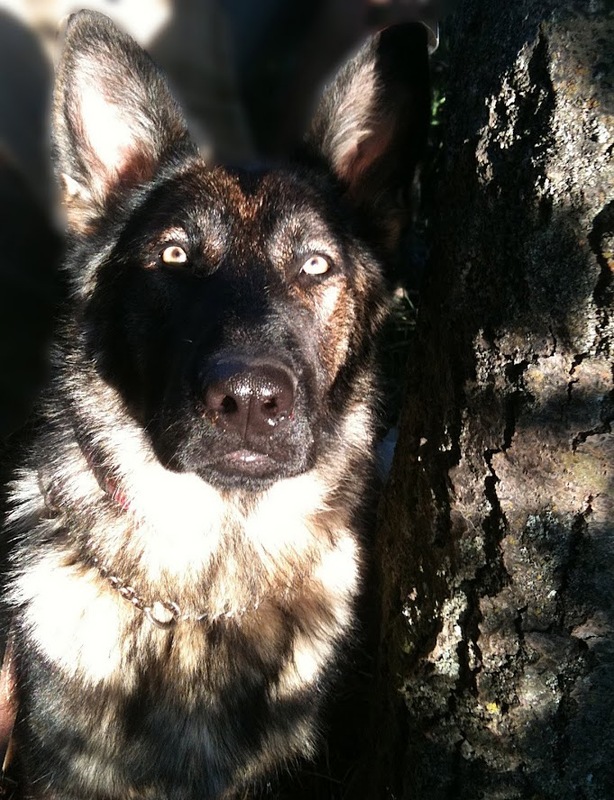 Ed Frawley has been breeding and training GSDs and Belgian Malinois for 50 years. I highly suggest his books, videos and courses. In particular one of his trainers, Michael Ellis is about as good as it gets for dog training. Ed has come around from aversive dog training to purely motivational over the years so pay more attention to the works his done in the past 5-7 years. I have a few things I disagree on him with but 95% is highly recommended. So, take everything they say, decide whether it feels right for you, and throw away the 5% that doesn't. You will learn a TON of good things from Ed, Michael, Tyler and all his other instructors. If you talk to Ed, or Michael, tell them I sent you! 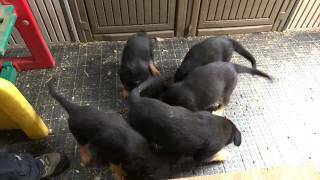 PS - for my brand new puppy owners, check out the video: Puppies 8 weeks to 8 months. You will learn a lot! But remember to throw away the 5% you don't agree with. A gentle reminder that you MUST register your microchips with the company for them to be of any use. How terrible would it be if your dog got lost, someone found him, scanned him and there was no name associated with the number! Please be sure to register! I am grateful to all the people who understand all the time, effort, and PASSION, I put into my dogs. Here is an excerpt of an email I received today. "How on earth do you do it.....you really are amazing Mary Ann. Your adult German Shepherds and puppies are testament to you. You should be very proud of yourself. Love all the time, effort and true dedication you put in to those beautiful animals of yours. Wish there were more people in the world like you.....Thank you Mary Ann." 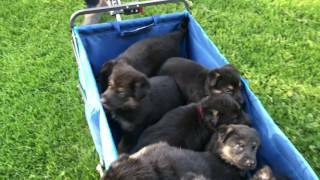 I Should Have a Sign on the Wagon Saying "Puppies For Sale"
Mary Ann Marcellus sent you a video: "I should hang a sign that says "Puppies For Sale"!" I should hang a sign that says "Puppies For Sale"! This reminded me of a young child pulling a wagon down the road looking for new homes for a litter of puppies! These 5 week old Guardian Angel Shepherd Puppies are actually moving out to their new building. They have been in the house but now need more room to run and play to build up muscle and coordination. 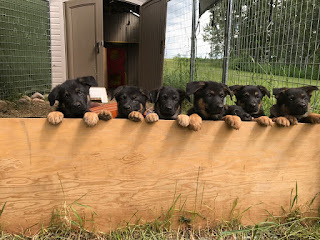 There are a few pups still available so don't delay! It's not often you can get a Guardian Angel Shepherd without a 6 month wait! I received a very nice email from one of the new puppy owners. It's letters like this that make the long days (and long nights) worthwhile. I was honoured to get a letter like this. I want to thank you for taking the time to talk with us. Your knowledge is vast. I could have sat there till late just picking your brain. I can see clearly what the dogs, and the pups mean to you. I am truly looking forward to the day we come back and get our pup. You run a fantastic operation there. Have a good weekend Mary Ann, and thank you. Thank you Chris, for the very kind words. My vet was here today and gave all the puppies a clean bill of health! Everybody is doing fine. They've got their shots, they were dewormed everything is on track.